Despite the vast amount of scholarship carried out by Western orient lists since the nineteenth century and the analyses and translations made of various Islamic sources, very little attention has been paid thus far to the collection of religious sayings, sermons, prayers, proverbs and didactic expositions which comprises the corpus of Hadith as understood by Twelve Imam Shi'ite Muslims. It is of course true that much of the substance of the Shi'ite hadith collection resembles the Sunni collection,  and to the extent that the latter has been studied the former has also been dealt with in an indirect manner. But in as much as Shi'ite hadiths possess a form, style and "perfume" of their own, no indirect treatment of their substance and content can replace the direct translation and analysis of this collection itself. It is in fact rather amazing that despite the extreme importance of Shi'ite Hadith for the development of Shi'ite law and theology as well as many fields of the "intellectual sciences" (al-'ulum al-'aqliyyah), not to speak of its role in piety and the spiritual life, the sayings of the Imams of Shi'ism have not been rendered into English until now. Nor have they been studied as a whole and as a distinct body of religious writings of an inspired nature within the general context of Islam itself. The present volume represents, therefore, a pioneering effort to present a sample of this extensive body of writings to the English speaking world. The Shi'ite hadith literature includes all the sayings of the Prophet of Islam accepted by Shi'ites as well as the traditions of the twelve Imams from 'Ali ibn Abi talib to the Mahdi. This collection is thus considered to be, after the Holy Quran, the most important body of religious texts for Shi'ites. As in Sunni Islam, so in this case: the Hadith forms along with the Revealed Book the basis of all the religious sciences, including of course the Shari'ah as well as religious life in both its intellectual and devotional aspects. No aspect of the life and history of the Shi'ite community would be comprehensible without a consideration of this body of inspired writings. What is particular to this collection, however, is that although it is a part of the foundation of Islam as seen by Shi'ism, its "composition" stretches over a period of more than two centuries. In Sunni Islam, Hadith is limited to the sayings of the Blessed Prophet. In fact to use the term "hadith" in Sunnism is to refer to his sayings and not to anyone else's. In the case of Shi'ism, however, although a clear distinction is made between prophetic Hadith (al-hadith al-nabawi) and the sayings of the Imams (al-hadith al-walawi), the two are included in a single collection. This means that from a certain point of view the apostolic age of Islam is seen by Shi'ism to stretch way beyond the relatively short period usually associated with apostles in various religions. The reason for this perspective lies of course in the Shi'ite conception of the Imam. The term imam as used in a technical sense in Shi'ism differs from the general usage of the term in Arabic, where it means "leader", or in Sunni political theory where it means the caliph himself. As used technically in Shi'ism the term refers to the person who contains within himself the "Muhammadan Light" (al-nur al-mahammadi) which was handed down through Fatimah, the daughter of the Blessed Prophet, and 'Ali, the first Imam, to the others, terminating with the Hidden Imam who is to appear again one day as the Mahdi. As a result of the presence of this light, the Imam is considered to be "sinless" (ma'sum) and to possess perfect knowledge of the esoteric as well as the exoteric order. The Imams are like a chain of light issuing forth from the "Sun of Prophecy" which is their origin, and yet they are never separated from that Sun. Whatever is said by them emanates from the same inviolable treasury of inspired wisdom. Since they are an extension of the inner reality of the Blessed Prophet, their words really go back to him. That is why their sayings are seen in the Shi'ite perspective as an extension of the prophetic Hadith, just as the light of their being is seen as a continuation of the prophetic light. In Shi'ite eyes, the temporal separation of the Imams from the Blessed Prophet does not at all affect their essential and inner bond with him or the continuity of the "prophetic light" which is the source of his as well as their inspired knowledge. This metaphysical conception is the reason that Shi'ites incorporate traditions stretching over two centuries into a single whole with those of the Blessed Prophet himself. It also distingiushes the Shi'ite conception of Hadith from that held in Sunnism. Otherwise, the actual content of Hadith in Sunni and Shi'ite collections is very close. After all, both kinds concern the same spiritual reality. Of course the chain of transmission accepted by the two schools is not the same. But despite this difference in the authorities who have handed down the prophetic sayings, the actual hadiths recorded by Sunni and Shi'ite sources have overwhelming similarities. The major difference is the Shi'ites' consideration of the extension of an aspect of the being of the Blessed Prophet in the Imams and therefore their addition of the sayings of the Imams to the strictly "prophetic" Hadith. Within the collection of Shi'ite hadiths are certain works which need to be mentioned separately. There is first of all the celebrated Nahj al-balaghah (The Path of Eloquence) of 'Ali ibn Abi talib assembled and systematized by the fourth/tenth century Shi'ite scholar Sayyid Sharif al-Radi. Considering the enormous importance of this work in Shi'ite Islam as well as for all lovers of the Arabic language, it is remarkable how little attention has been paid to it in European languages. After all, many of the leading writers of Arabic such as Taha Husayn and Kurd 'Ali claim in their autobiographies to have perfected their style of writing Arabic through the study of the Nahj al-balaghah, while generation after generation of Shi'ite thinkers have meditated and commented upon its meaning. Moreover, the shorter prayers and proverbs of this work have spread very widely among the populace and have entered both the classical and folk literature of not only Arabic but also Persian, and through the influence of Persian, several other languages of the Islamic peoples, such as Urdu. The Nahj al-balaghah contains, besides spiritual advice, moral maxims and political directives, several remarkable discourses on metaphysics, especially concerning the question of Unity (al tawhid). It possesses both its own method of exposition and a very distinct technical vocabulary which distinguish it from the various Islamic schools which have dealt with metaphysics. Western scholars refused for a long time to accept the authenticity of the authorship of this work and attributed it to Sayyid Sharif al-Radi, although the style of al-Radi's own works is very different from that of the Nahj al-balaghah. 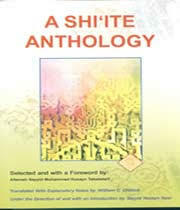 In any case as far as the traditional Shi'ite perspective is concerned, the position of the Nahj al-balaghah and its authorship can best be explained by repeating a conversation which took place some eighteen or nineteen years ago between 'Allamah Tabatabai, the celebrated contemporary Shi'ite scholar who is responsible for the selection of the present anthology, and Henry Corbin, the foremost Western student of Shi'ism. Corbin, who himself was as far removed from "historicism" as possible, once said to 'Allamah Tabataba'i during the regular discussions they had together in Tehran (in which the present writer usually acted as translator), "Western scholars claim that 'Ali is not the author of the Nahj al-balaghah. What is your view and whom do you consider to be the author of this work ?" 'Allamah Tabataba'i raised his head and answered in his usual gentle and calm manner, "For us whoever wrote the Nahj al-balaghah is 'Ali, even if he lived a century ago." The second volume, called The Quran in Islam (Qur'an dar islam), was also written by 'Allamah Tabataba'i and its Persian version printed in Tehrarn. Most of it was also translated by us into English, but the translation was not completed. The events of the last year in Iran have made the manuscript of what we have already translated inaccessible to us so that there is no possibility at the present moment to produce the English translation as planned. The present volume is the third and final one in the series. After a long period of study and deliberation, 'Allamah Tabataba'i made the present selection from the vast collection of Hadith, a task which would have been bewildering for anyone not possessing his knowledge of this inspired literature. Once this selection was made, Dr. William Chittick, who was then residing in Tehran and working with us on various scholarly projects, undertook the arduous task of translating the very compact and difficult Arabic texts into English. Because of the lack of precedence for rendering these writings into European languages and the nature of the texts themselves, Dr. Chittick was faced with a formidable task. It was only his intimate knowledge of Arabic, Persian and the subject matter combined with great patience and meticulous scholarship that made it possible for him to succeed in such a laborious and exacting undertaking. He should be congratulated in every way for having successfully concluded this colossal task. It remained for the Muhammadi Trust to bring the project to fruition and to make its publication possible. The credit for this volume and its effect in making Shi'ism better known must be given to a large extent to the Trust. As one who was responsible for this volume from its inception, I want to thank the Trust especially Wg. Cdr. (ret'd.) Q. Husayn, its very able secretary who with great love and devotion to the true cause of Islam, enabled us to complete this project. Dr. Chittick, also, has earned the gratitude of all students of Islam for his fine scholarship and devotion to the completion of a very difficult project. This volume is particularly pertinent at the present moment, when volcanic eruptions and powerful waves of a political nature associated with the name of Islam in general and Shi'ism in particular have made an authentic knowledge of things Islamic imperative, lest ignorance destroy the very foundations of human society and the relations which make the discourse between various nations and religious communities possible. At the dawn of this fifteenth century of the terrestrial existence of Islam, may this volume be an aid in bringing about an understanding of one of the fundamental sources of inspiration and knowledge for not only Shi'ism but Islam as such. There are six canonical collections in Sunni Islam which have been accepted by the whole community since they were first compiled in the second and the third Islamic centuries. These collections, referred to al-Sihah al-sittah, the Six Correct Collections, are associated with the names of great scholars of Hadith such as Bukhari, Muslim, etc. Of these, the most famous is that of Bukhari, which has been translated into English (Sahih al-Bukhari: Arabic-English, by Muhammad Muhsin Khan, Islamic University, Madina; second revised edition, Ankara, 1976). The vast concordance of Hadith by Wensinck, Mensing et al. (Leiden, 1936-69) is based on these six collections. See 'Allamah Tabatabai, Shi'ite Islam, London-Albany, 1975, pp. 173ff. As far as the continuity of the chain is concerned the Isma'ili conception is of course different, since for the Isma'ilis the chain of Imams continues un-interrupted to this day. This monumental work was translated into French by H. Corbin, who taught it for many years in Paris, but it has never been published. See Corbin, En Islam iranien, Paris, 1971. This work has been translated several times in part or wholly in the Indo-Pakistani sub-continent and in Iran, but none of these translations is completely adequate. A new translation as been prepared by S. H. Jafri which is supposed to be published soon and which, we hope, will fulfill the very difficult condition of doing justice to both the meaning and the literary beauty of the text. See H. Corbin, En Islam Iranian. Not only Mulla Sadra, but also his students were deeply influenced by this collection. One of Mulla Sadra's most famous students, Mulla Muhsin Fayd Kashani, who was at once theologian, gnostic and philosopher, was also an outstanding authority on Shi'ite Hadith. His al-Wafi is one of the most studied works on hadiths of the Shi'ite Imams and their lines of transmission. In our introduction to that work we have dealt with the conditions under which these works were conceived as well as a biography of 'Allammah Tabatabai.